“That’s the only reason?” She wasn’t sure why she was disappointed. “What were you hoping I would say?” His gaze locked on hers and held it. Luke moved closer to her. Molly’s breath caught, and the sound of her racing heart filled her head. She did her best not to look at him, but her need to see his eyes was too strong. She gazed up and found he was staring at her with nothing but passion in his eyes. She inhaled a spicy fragrance that tingled her senses. He reached out and rubbed his hand along her cheek. She closed her eyes out of instinct. Just the feel of him touching her brought back feelings she hadn’t experienced in a long time. The nerves in her body stood on end, and it was almost as though she were being tickled. She shouldn’t be enjoying this. In fact, she should tell him to stop again and not come any closer, but, man, did it feel good, for once, to just feel. And feel she did. He was close enough now that she felt his warm breath touch her skin. Opening her eyes, she saw his focus was on her lips—his mouth inches away. If she made the slightest movement, she’d taste him. She ached to grip his shirt and pull him to her. If they kissed, it would be passionate and ignite a fire deep within her. She hadn’t kissed another man since Steven. Could Luke be the first? She pushed up on her tiptoes. She was going to do it. Reaching out, she was about to wrap her hand around his neck. Her gaze was locked on his, and it was as though they were moving in slow motion. “Sheriff, you in there?” A man pounded on the door, sending it flying open. 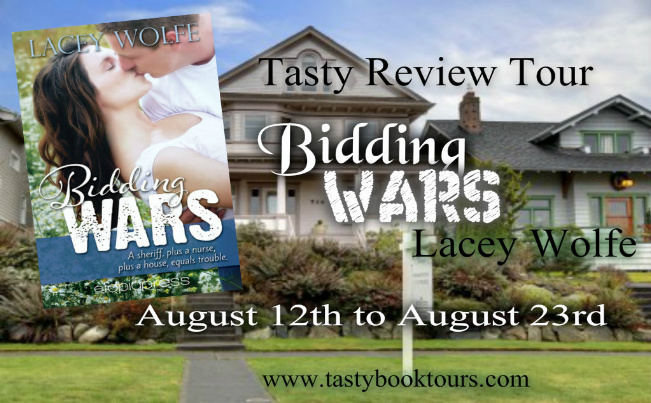 Bidding Wars is the first book in a new series (Love Strikes) by the lovely Lacey Wolfe. She has done it again with this book and gives us a sweet romance with just enough drama and twists thrown in to keep you from putting the book down. Molly and Luke are great characters who both want the same house in a nice little neighborhood. 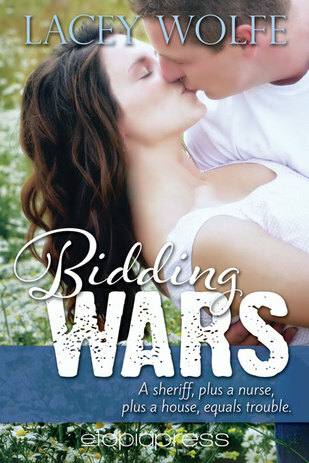 So a bidding war begins ~ until they come face to face . . . The sparks that fly between them make this about more than just a house. Can they come to an agreement about the home they both want? 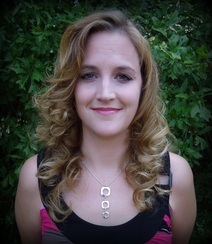 Lacey creates a real life experience that many people can relate to on multiple levels with her characters and situations. There really is no fluff, the characters encounter gritty scenarios and struggle with them just like you or I would. I think that is my favorite part about Lacey's books ~ I can relate to the situations she puts her characters through on a regular basis. Recommended if you like a sweet realistic romance that deals with issues and situations that you might face or have faced! A fairly quick read, perfect for a relaxing summer day. The book seems great. I love finding new series that are fresh and different. Thanks for the giveaway. Thanks for the great giveaway chance! Love the cover and blurb! Sounds great!